Jimmy Stewart’s “Wonderful Life” movie is a popular movie to watch at this time of year. I always think of that movie when I hear from my alums over the holidays, too. What if GEO didn’t exist? This morning, I heard from one of my Gary alums who endured 6 different homeless shelters and several foster care families (split from his siblings) while in our school. He is now in his 3rd year of med school at the University of Virginia on a full scholarship. He shared that he is headed to South Africa this summer for a medical research project. Wow! That’s grit. That’s perseverance. That’s wonderful!! I’ve heard from many of our alums over the holidays. Some are finishing law school, others are finishing up their second, third and fourth years of teaching, while others are enjoying life as nurses, engineers, and still others are having a great career playing Division 1 basketball for their universities. Others are reporting to me they are engaged or just got married, and others are enjoying parenthood. Yes, it’s a wonderful life! I wonder what role we played in these outcomes. The families we serve have grit, know how to persevere, and they also know to seek out great opportunities in life. I’m glad our paths crossed. I’m grateful I’ve crossed paths with so many people who care just as much as I do about making a difference. I’m grateful GEO has been put in a position to have a long lasting impact on so many families thus far and I very much look forward to continuing to serve. 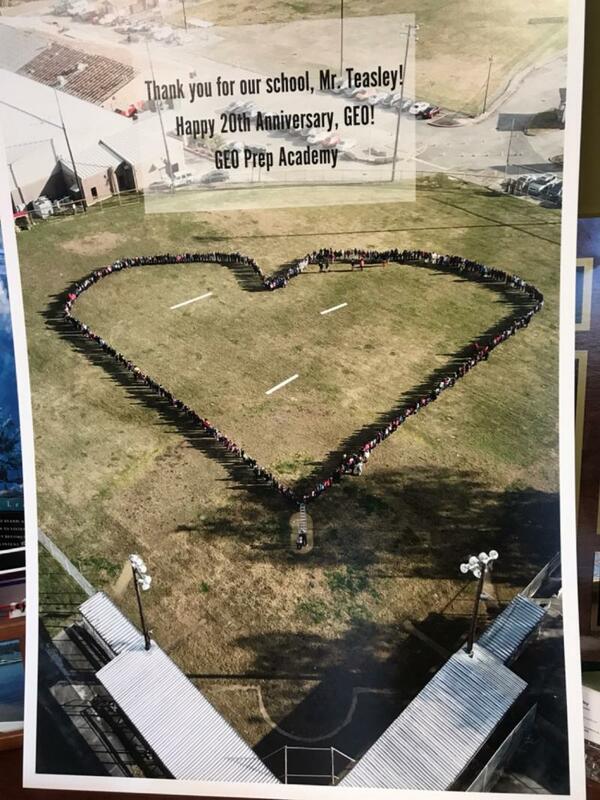 GEO celebrated 20 years of service in 2018. I can’t wait to see what happens over the next 20 years! The picture above is a thank you card featuring every student and staff member from our Baton Rouge school out on the baseball field forming a very special shape. The stories above are of my Indiana alums. We’re just getting started in Baton Rouge. Can’t wait to see what the future holds in Louisiana.